HTC Flyer was presented to the public this year at the MWC 2011 in Barcelona. This Google Tablet PC was then presented with Android 2.x and (despite claims made by HTC), nobody was really sure if the tablet will receive an "upgrade"to Honeycomb. Google's recent actions in respect of licenses and the "struggle" with the fragmentation of the platform wasn't exacly optimistic. It may be worthwhile to recall why (in contrast to several other tablets) HTC announced their product with an older version of Android. It's beacuse of Sense Interface UI. 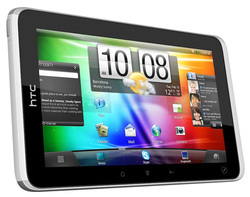 HTC just like Samsung plans to release it's product with a different interface than the one known to you from Motorola Xoom. But they just didn't have enough time to prepare the working version of the interface for the new system and therefore they presented Sense working on Android 2.4.